New layered shades won’t just look great on your windows, they’ll also allow you to control light input from outside and protect your property’s interior from UV radiation. The unique striped pattern of these window coverings makes them one of the most versatile shading solutions available today. You can adjust them according to how much natural lighting and privacy you want, without lifting the shade completely off the window. 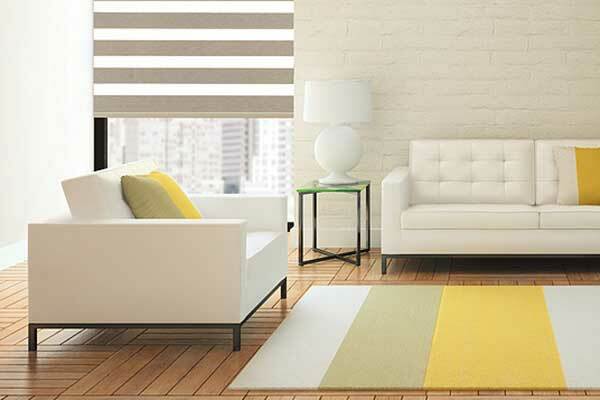 These coverings consist of two layers of fabric or synthetic material patterned with sheer and opaque stripes. The layers move on a loop, and the stripes either sit parallel to each other, blocking out sunlight, or adjacent to their contrasting bands, letting diffused sunlight in. You can adjust them according to your current preference whenever you want, and stay protected from UV rays whether the sheer stripes are showing or not. There really isn’t an area of your home or business where layered shades won’t be suitable. Their unique design – zebra-like stripes patterned in contrasting shades – gives them an elegant and simple look that can serve as a simple décor contribution or a more sophisticated design enhancement. As long as you ensure the color and design style you choose matches and complements the rest of the room’s surroundings (which is something Newport Beach Blinds & Shades can help you with) you’ll be all set on that front. 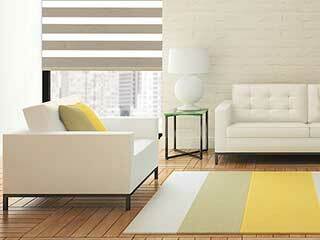 One of the latest innovations in the window treatment field is motorization. This type of enhancement has really picked up speed and is fast becoming a near staple in many LA homes and business establishments. From hardwired to solar powered, motorized layered shades will bring you lots of added benefits that their hand-drawn counterparts aren’t capable of providing. You can even opt for self-adjusting layered shades that utilize brightness and temperature sensors to maintain a certain pleasant ambiance throughout the day. Newport Beach Blinds & Shades has a selection of beautiful and functional window treatments that every local homeowner can benefit from. Get in touch with us to learn more about the versatility and beauty of layered shades with a free in-person consultation at your property. From easy to maintain vinyl blinds to solar shades to allow in natural light without the sun damage, our team has it all for you to explore and find the perfect thing for any area. You can count on the experts to help you find what you need for a fair price! Discover more about us by browsing our site. Thank you for choosing Newport Beach Blinds & Shades! Feel free to browse our website for more useful information until our appointment!